My name is John Johnson but everyone here calls me Vicki. 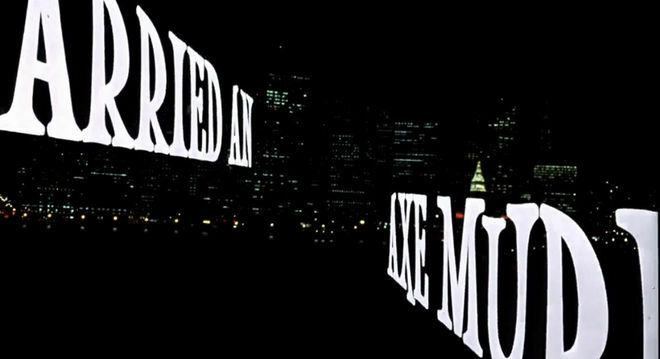 The opening sequence of the 1993 Mike Myers-helmed black comedy So I Married An Axe Murderer flies viewers from a nighttime city skyline into the bowels of Cafe Roads, a beatnik bar in San Francisco, by way of a cup of coffee. 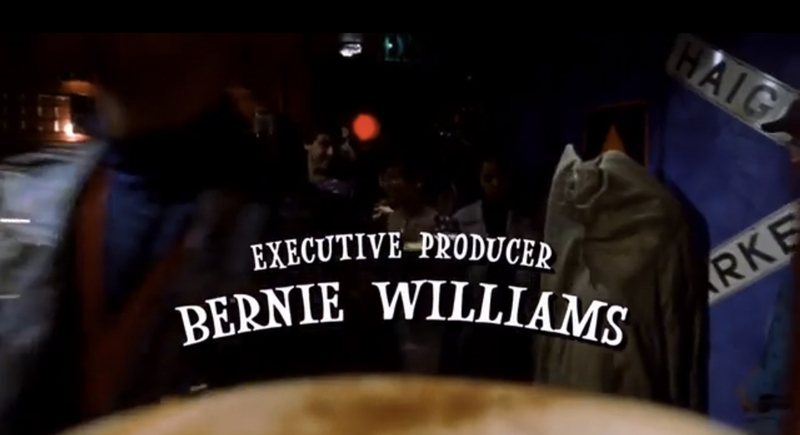 The credits, created by Title Designer Robert Dawson (Edward Scissorhands, Repo Man) appear in a white goofy serif, the words arched upwards. When the main title card appears, the two lines of text swing out in two directions, like a pair of arms opening on the city. The external shots of Cafe Roads are actually of the historic Vesuvio Cafe, located at Columbus Avenue and Jack Kerouac Alley in North Beach, San Francisco, a bar which was in fact frequented by Beats including Jack Kerouac, Allen Ginsberg, and Neal Cassady, and other figures like Dylan Thomas, Bob Dylan, and Francis Ford Coppola. In the film, this is where main character Charlie Mackenzie (Myers) somehow makes his living as a beat poet, drinking laughably large bowls of coffee, smoking, and performing his craft. In the opening scene, the camera walks us into Cafe Roads and is quickly swept up into a coffee point-of-view shot. Our view is the cup’s view, transported from tray to sink and back again, lifted through a multifarious crowd of characters – including what appears to be a person flailing about in a sack – and delivered into Charlie’s outstretched hands. The La’s “There She Goes” – here performed by English alt-rock band The Boo Radleys – accompanies the sequence, playing in stark contrast to the title of the film, which clearly promises grisly violence. Originally, the main title sequence was to feature a musical piece by Bruce Broughton, the film’s score composer, but was ultimately supplanted in favour of a pop tune, starting the film off on a light-hearted note. Myers agreed to star in the film because he was fond of the story and its themes resonated with his and many of his friends’ experiences at the time. In a 1993 interview with the Montreal Gazette, Myers says they "were all suffering from cold feet and what is cold feet but a low-grade terror? This story just expands on that terror". The opening scene and its POV shot is only one of two such shots in the film, both used to draw the viewer into the scene in a specific way. In the opening, the camera is hunting for its prey, the coffee used as a comedic stand-in for the journey towards the main character. Later in the film, when the plot points have been established, the camera takes on Harriet’s viewpoint, following Charlie when he gets up to go to the bathroom, lending the scene a sense of low-grade terror. The POV shot is a technique especially beloved by thriller and horror filmmakers who aim to draw their audience deeper into a shot, to see events through the eyes of a particular character – in this case, Harriet, whose motives are as yet unclear. The POV shot and the music place her in a sinister light. 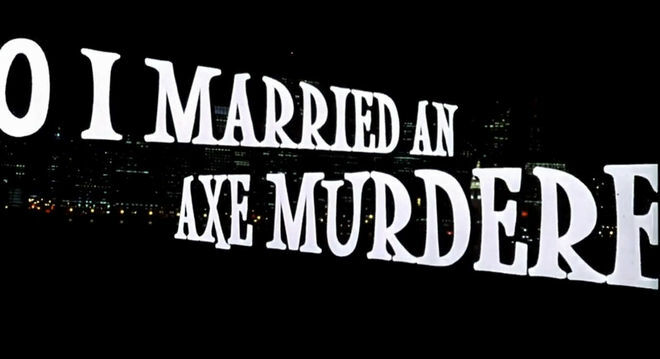 Like the hilarious opening to The Naked Gun, the POV shot in So I Married an Axe Murderer’s main titles is meant to draw the viewer in and to subvert expectations from the outset. While Axe Murderer may not have succeeded in much else – it was not well received at the box office upon its release and was called a “trifle, at best” by San Francisco Chronicle critic Edward Guthmann – its opening at least succeeded in enticing viewers with an upbeat and uniquely shot title sequence.